This past week we have had some beautiful weather in New England. It evokes fond summer memories of swimming, eating outside and watching the kids chase fireflies. Other memories come to mind too, such as playing Name That Spot on my kids’ bodies. By mid-summer my kids’ skins look like a veritable galaxy of constellations. Heat rashes, poison ivy and insect bites mark my kids, making it difficult to identify the cause of the spots. In addition, there are a number of rash-inducing viruses that like to pop out and enjoy the warmer weather. Other than leaving their mark on your kid’s skin for a few days, these viruses are generally mild and induce little to no symptoms. Although this rash is seen late in winter, it is also seen in the springtime. Children with Fifth’s disease have a characteristic rash on their face that looks as though their cheeks have been slapped (also called “slapped cheek” syndrome). The rash on the face might also resemble sunburn. Sometimes a lacy rash will also appear on the arms and legs, and less often on the trunk. 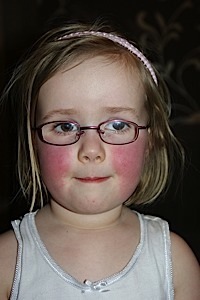 The rash is more visible when a child becomes heated, such as after playing outside or in the bath. The rash usually goes away after 7-10 days but can continue to come and go for several weeks. Children with Parvovirus B19 usually have very few symptoms other than the rash. In some cases they may develop a low-grade fever and runny nose or have a few days of feeling crummy. Sometimes a child might complain of itching; this can be relieved by using a soothing lotion or by taking cool showers. Fifth’s disease is caused by a common virus called Parvovirus B19. This is not the parvovirus that infects dogs and cats, so your child did not catch it from Rover. The virus is spread through sneezing and coughing. The enteroviruses are a large group of viruses – at least 63 different enteroviruses are known to infect humans. The majority of these viruses appear in the summer. Prior to vaccination, poliovirus was the most infamous enterovirus. Parents used to be afraid to allow their children to play outside during the summer months for fear of getting polio. Luckily, we don’t have to worry about polio anymore and the rest of the enteroviruses cause milder disease. The name of this disease is pretty descriptive for where the rash occurs. Children with HFMD develop small, tender blisters and red spots on the palms, soles of feet and inside the mouth (usually on the tongue, gums and cheek). Prior to developing the localized rash, a faint rash might be observed over the body. Children with HFMD may also have general “cold-like” symptoms such as low fever, sore throat and tiredness, typically before the rash appears. Children can also develop diarrhea. Symptoms typically last 5-7 days. HFMD is caused by 2 different types of enteroviruses: a group of viruses called the Coxsackie A viruses and another virus called Enterovirus 71. The viruses that cause HFMD are very common and are spread easily, particularly wherever children are grouped together (think summer camp). Herpangina is also called mouth blisters and is seen as a very localized mouth rash towards the back of the mouth. The blisters will typically last 7-10 days. Children with this infection typically have a high fever, sore throat, headache and loss of appetite. Herpangina is often mistaken for strep throat until the culture comes back negative. There is no treatment for herpangina other than giving over-the-counter pain relievers (but never give aspirin to a child with a viral infection). Herpangina can be caused by Coxsackie A viruses, a second group of Coxsackie viruses called B viruses, or a third type of enteroviruses called echoviruses. Children often develop summer-time rashes over parts of their bodies that have no clear cause. If the rash is also accompanied by mild symptoms similar to the common cold or the child also has a sore throat or diarrhea, it is often assumed that enteroviruses are the cause. Given the number of viruses in this family, this is probably a good assumption! I hope you don’t have to play Name That Spot too often this summer, but if you do, I hope you find this post useful! I am a scientist and mother of 5 children. I used to work full-time in my laboratory and try to be a hands-on mom. It wasn’t working. A major move gave me the chance to explore other options. 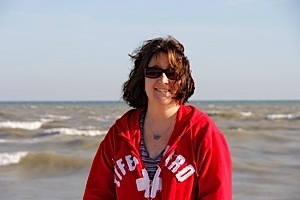 I began science writing and started my blog, madscientistcrazymom.com, to share my experiences. Thanks for the tips. 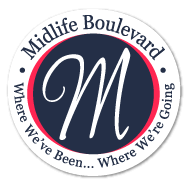 Your Mad Scientist Crazy Mom blog sounds great! Thanks for reading. My kids have had a few of these viruses over the years and they always leave me guessing which one it is! This now has me questioning every weird itch or blemish I have on my body. Don't worry – you probably already had them when you were younger! Luckily that's one thing my kids have not had! Why don't you give asprin to a child with a viral infection? Children given aspirin when they have a viral infection can develop something called Reye's syndrome. Reye's syndrome is a potentially life-threatening disease that is almost always seen after a viral infection. It affects the brain and liver. Children with Reye's have frequent vomiting, sleepiness, irratability and then can develop irrational behavior, seizures and loss of consciousness. It is rare, and cases have dropped to only a few per year since doctor's have told parents not to give aspirin for viral diseases. Aspirin should never be given to a child with a fever or flu-like symptoms. Honestly I just completely avoid giving aspirin to children. Acetominophen (tylenol) or ibruprofen (advil) can be used instead. Just to correct myself, it is almost exclusively seen after a viral infection (not seen after almost every viral infection)! I know my children has had Rosiola after a high fever and illness. We have also dealt with thrush in the household. One time I rushed my son to the ER because he had a head to toe rash and once there realized he was having a reaction to daddy's cologne he put on after his shower. We went home and re-showered and the rash was magically gone.